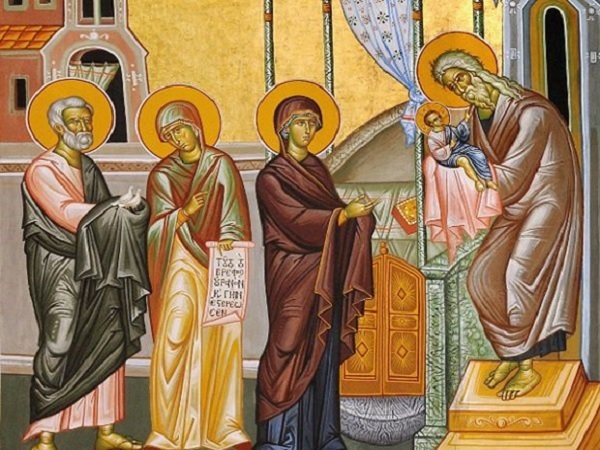 ‘You sanctified the virgin womb by Your birth’…  The Holy Church celebrates the Reception of the Lord in the Temple of Solomon, a feast of the Lord and of His mother. It’s a feast of the Lord because the person being honoured is Jesus Christ, Who, as a forty-day old infant manifests His utter humility and total obedience to the will of God in order to achieve the salvation of the human race. It’s a feast of His mother because it’s she, Mary, the Mother of God, who presents the infant Christ to the venerable Symeon. It’s a feast with a long pre-history, beginning in the time of Moses and the Pharaoh of Egypt. ‘Ypapanti’, the Greek name of the feast, means ‘reception’ or ‘coming out to welcome’. So it’s the arms of the venerable Symeon receiving Jesus in the temple. In chapter 13 of the book of Exodus in the Old Testament, we see God requiring Moses to establish the law that all first-born male offspring were to be offered as a ‘sacrifice’, in commemoration of the fact that Israel was delivered from enslavement to the Egyptians through the death of all the first-born sons in Egypt . The presentation of every first-born son in the Temple also signified complete dedication to God. Their presentation denoted their submission to the will of God, which meant that God had the right of life and death over them. This was acknowledged by the parents, who paid a lamb, a pair of doves or two fledgling pigeons to redeem their child . Being poor, the parents of Christ didn’t offer a lamb. Lambs were offered by rich families, whereas the poor offered birds. The offering of the pair of doves or the two fledgling pigeons was an image of Christ. Saint Cyril, Archbishop of Alexandria, tells us  the dove is the most voluble among the birds of the field, while the pigeon is characterized as being meek and mild. Thus it was that the Saviour not only had meekness in the perfect degree, but His mellow voice also filled the ‘vineyard’, that is all those who would come to believe in Him. 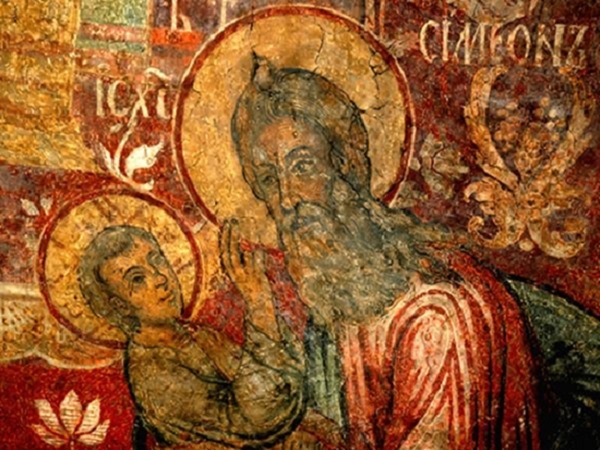 According to the Law of Moses, then, as soon as forty days had passed from the day the first male child was born, the child had to be taken to the temple, accompanied by his parents, in order to receive the first blessing. In accordance with Mosaic Law, Jesus was taken to Jerusalem in order to be presented to the Lord. In other words, every first-born male to open the womb had to be considered an offering to the Lord. And an offering had to be sacrificed, as Saint Athanasios the Great reminds us in his homily on the Reception . In his homily on the Reception, Saint Gregory Palamas mentions that the pair of doves denotes the prudence of the parental couple, who are faithful helpmeets in their marriage. The two fledgling pigeons clearly signify the Virgin and the Son born of her who remained a virgin to the end, because the two young birds had no part in marriage, as was also the case of the Virgin Mary and her Son, Jesus Christ . The creator and lord of the Law, became subject to it in all things. He was circumcised in accordance with the Law; He went up to Jerusalem, as it was written; He was offered as a sacrifice, as the law of the Lord required: ‘You are obedient to the laws of nature and the ordinances of scripture and submit to the law, Christ, You who once dictated the law to me on Mount Sinai’ . Through all this, He made our nature obedient to the Father and healed the consequences of our disobedience, transforming it from a curse into a blessing, in the words of Saint Gregory Palamas. 1. Kontakio for the feast of the Reception. 2. Exodus 13, 1-2 and Leviticus 12, 1-6. 4. Saint Cyril, Archbishop of Alexandria, Homily 12, On the Reception of Our Lord Jesus Christ, PG 77, 1041 AB. 5. Saint Athanasios the Great, Interpretation of the Gospel according to Saint Luke, Works 12. 6. Saint Gregory Palamas, Homily on the Reception of the Lord. 7. Tropario of the first ode of the canon for the Forefeast, 1 February.